#1 - Great Santa Cruz Island (Zamboanga City, Mindanao): If you're looking for something unique, go visit Great Santa Cruz Island -- so popular due to its fine pink sand that got its color because of the presence of pink corals there. Just prepare your own drinking water, rice or corn, goggles/snorkel to enjoy your time there, along with the nice seafood the locals can prepare for you. No need to worry about security problems, since the Philippine military are visible all around this pretty beach. Moreover, you'll just have a limited time to stay there with a specific number of people. Contact the tourism office in Zamboanga first to check on the available dates for a visit -- to ensure your maximum enjoyment and pleasure. #2 - Sila Island (San Vicente, Northern Samar): Sila Island is one of the most impressive beaches you could ever visit in the Philippines. 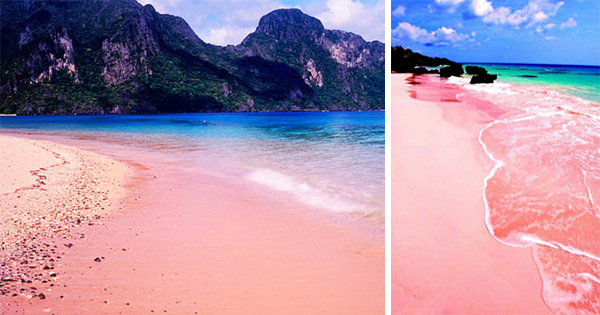 Here you'll see Pink Sand Resort that rents out cottages for a day. Even if the sand is not ultra mega pink, up close though, its pinkish color is noticeable. You'll enjoy this super clean and beautiful island for sure, and have fun doing relaxing with some munching, as well as snorkeling -- so get ready with your own food, drinks, garbage bag, toilet paper, sunblock, reef shoes, snorkeling gear, and don't forget, your utmost cheer!